A fascinating little robot called the Robo-Air Jet System uses a multi-axis robotic nozzle to manipulate small objects, like small fruits, in mid-air. Take a look at the fairly cool video of the Robo-Air Jet System, created by Aaron Becker and Robert Sandheinrich from University of Illinois. Stereo cameras track the object; computer models direct the flow of air from the nozzles. Very impressive fluid modeling; just look at the vagaries of air currents when manipulating two objects. 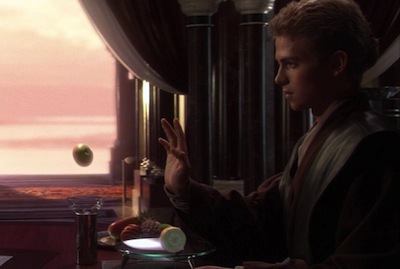 I'm sure we all remember this scene from the more recent Star Wars series, in which Anakin, boy Jedi, 'Force'-feeds some fruit to Padme. During this holiday season, don't neglect the gift giving possibilities - see the Jedi Force Trainer toy.